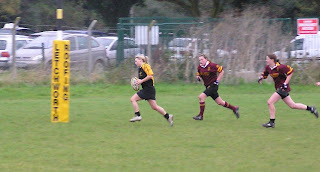 Two more of our players have been added to the county squad - Charlie (or should that be "Charlotte"?) Hughes and Laura Watson - giving us six representatives in the squad overall. 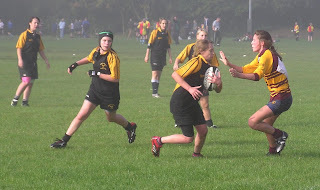 In addition there will also be one player each from Old Albanians and Tabard, with the rest of the 24-player squad all now being from Welwyn - the two girls orginally selected from Saracens do not now appear in the final list. 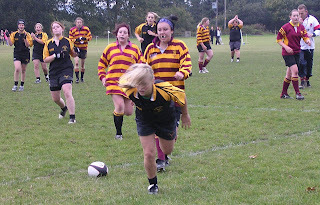 This Sunday there is an U18s home game against Ampthill. Will all players please meet at the club at 1pm for a kick-off at around 1.45pm. Unfortunately, as neither Ampthill nor ourselves have many of our U15s available, the U15 fixture has had to be cancelled. 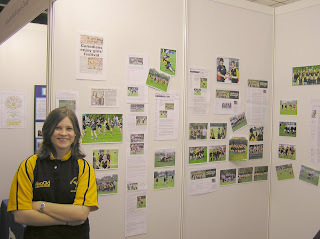 Junior Stag - the club's junior newsletter - is seeking articles. Match reports, mainly, but I guess they would more than welcome other items. 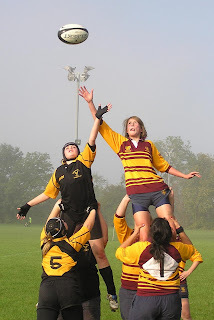 Given the amazingly low level of participation in the girls section by daughers and sisters of other club members, the Junior Stag's readership can be seen as a prime source of new recruits. And rather than having the usual suspect write stuff, I wondered if it might be more effective if it came from writers with more direct on-field experience? So - would anyone be able to write something for Junior Stag? If so drop a line to the editor, Keer McPhee. Confirmation has now come through that Fern has made the East Midlands county team. The news (or at least the earlier trailing of it) has resulted in a small flurry of email exchanges as apparently the initial draft of the "Regional Rationale" (ie. 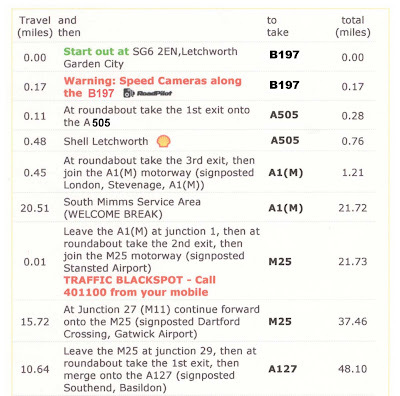 the document that describes how the regional programme will run this season) stated that Bedfordshire was in East Region - not East Midlands. The mild mayhem this would cause (Beds not being a CB in its own right, but part of East Midlands county along with Northamptonshire, would have no-one to run their regional selection! ), not to mention the complete lack of prior consultation, resulted in some of us suspecting that something was amiss when the new regional management at East brought it to our attention. And the good news is that RFUW have not taken leave of their senses and that Claire Sanderson from RFUW has confirmed that it is indeed a mistake. Phew! 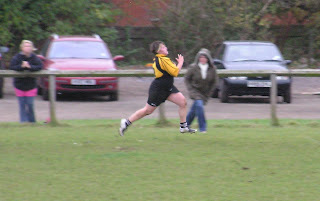 However, if Fern had not been selected for East Mids from a Hertfordshire club then who knows how long it would have been until someone had spotted it! The club have announced that there will be new arrangements for dishing out the post-match meals, starting next Sunday (when we are at home to Ampthill). The home team captain will now have to go to the food hatch before warm up and will receive two blocks of tickets - one block for the home team, one for the away team. Either before the match or after the match, the home captain will hand one block of tickets to the away captain. Each captain will be responsible for handing out the individual tickets to the players. The players will then go to the hatch for a swap of ticket for a meal. No ticket, no food. The "final" trial for the Hertfordshire U18 squad a bit of a disapointing yesterday - only around 12 players attended, of whom only Charlie (I think) was not already in the squad - which will make the finalisation of the county squad a shade challenging. As you will have seen from the county blog there is a special session for backs tonight at OAs, starting at 7.30 - after yesterday the door is definately still open, so if you can make it you stand a good chance of making the final team. Better news from other counties is that Sasha has won her place in the Eastern Counties squad, and some similarly good news from East Midlands is expected once the selection there is made official. I also hear that Eastern Counties demolished Middlesex yesterday (score awaited) - looks like the title of leading county in East Region could be a very close three-way battle this year! 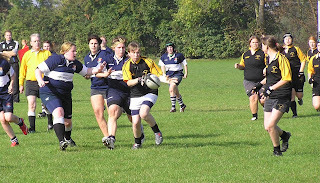 Hertfordshire are carrying out a survey about what you think of the county teams, training, selection, and development days generally (see here). Please spare five minutes to reply. I know from previous experience with similar things like awards and the like that you are a modest lot and most disinclined to express any opinion at all (on paper at least - such reluctance to tell us what you think tends to vanish when we see you in person!) but this realy, really, really is important. And it also half-term, the weather's miserable, and you've nothing else much to do - I mean there's a whole week to do that homework - so come on..., please? The survey is most definately NOT just for those of you who are in county squads - or even just those who have attended county days this season. It for anyone who is Hertfordshire qualified. The county structure exists to serve you - the players - and no-one else, and county officials need to know what is working... and what isn't. Without that feedback everyone is working in the dark by guesswork. Ask Heather for copies of the survey (though she'll probably give you a copy anyway!) and return them to her. Needless to say this is a purely Hertfordshire county exercise. 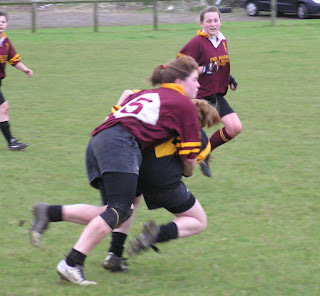 East Midlands and Eastern Counties players need not reply. 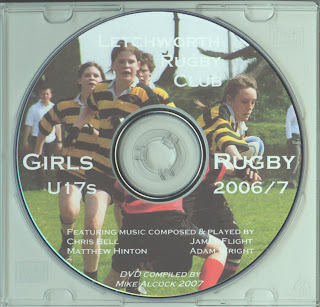 Letchworth Girls Rugby DVD hits the USA! The promotional DVD we produced at the end of last season is about to have it's North American premiere! The DVD you sent me is terrific. 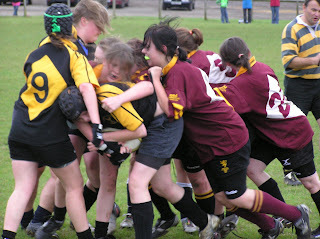 It certainly is images of girls’ rugby that our girls can relate too. I intend to use it this Friday at our first recruitment meeting. 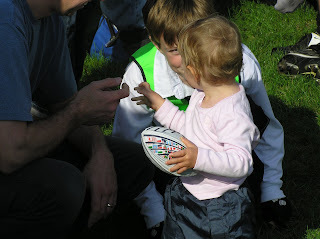 It will be particularly helpful for parents, who have no idea what rugby is, to get a feel for the game. Again, many thanks and best wishes to you, your family and your team. Not yet firing on all cylinders? 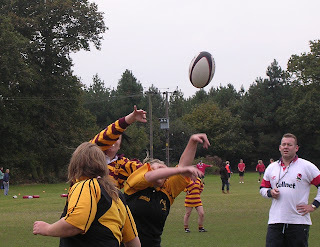 There were good points and points to work on from yesterday's Rochford 10s. A mid-table position was really what we deserved on the day, but we know that have the ability to do much better. The positive is that we all know that we can play so much better and there are any number of ways we can realistically improve on our performance. 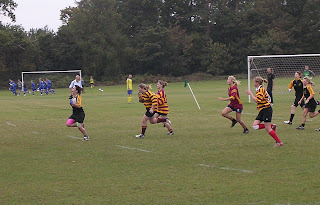 And against Sudbury, and for part of the time against Aylesford, we were playing almost as well as we did last year - if we had maintained that standard thoughout we might have been in with a shout to retain the title. Unfortunately we were dreadfully inconsistent. The dithery response to restarts continues to be a major Achillies heel, and was compounded yesterday by a remarkable reluctance to dive on a loose ball when kicked ahead by the opposition - something that cost us at least two tries. Both of these faults centre on the same thing - indecision over what to do when the ball is bobbling around at our feet, but hopefully we have now learnt that standing around in horrified fascination (as if it were some sort of unexploded bomb) is asking for trouble - as is leaving it to someone else to defuse. The solution is simple - in case of doubt dive on it! The opposition have to let you get to your feet, which means that you keep possession and gain a vital couple of seconds for support to arrive. "I'm sure I saw a ball around here somewhere..."
The other negative was our tendency to take too long to "get our game heads on". 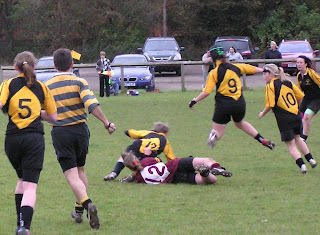 Admittedly we were not alone and against Westcliff in the first game both sides spent the first period apparently trying to see who could make the most embarrasing errors (an inability to see from one end of pitch to the other didn't help). 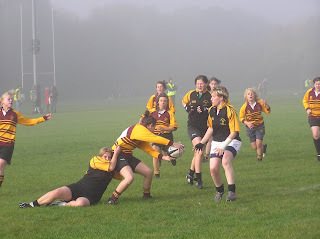 Our problem was that mist cleared from Westcliff's minds rather sooner than ours - they woke up in the second half of this game whereas we seemed to still be fast asleep until the second half of the following game with Aylesford! This was a pity as once we did realise that the tournament had started - ie. 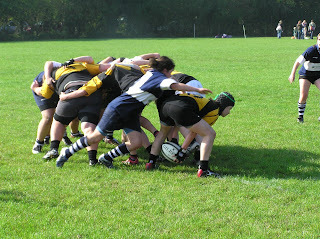 the game with Sudbury - we were back to our best, playing as well as we did at Wimborne last month. But then - after a full lunch - it was (from what I hear) slumberland again when Basford hove into view (fundamental rule - you cannot run through Basford's defence, any more than you can run through a brick wall! 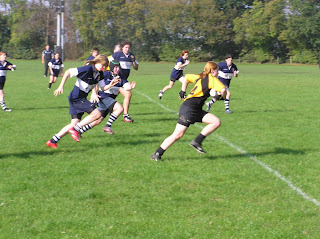 ), rounded off by a very tired performance against Welbeck College. Maybe last year we did benefit from going to Beckenham after all? 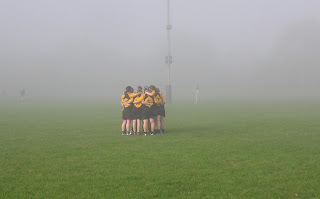 For all of it being a long way to go for not much rugby, it perhaps did allow us to wake up before Rochford and maybe we performed better as a result. I also suspect we a missing a certain inspirational 18-year old far more than we realise (and no, I don't mean Joe...). Despite whatever some may have been saying, we are still fundamentally the same team as last season - and the good news is that with the Nationals 10s and National Cup now in the spring we now have plenty of time to find that form again. 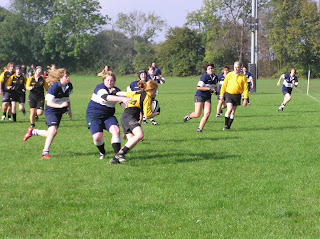 A slideshow of photos from yesterday, taken by Natalie's mum Joan, are now available at http://www.flickr.com/search/show/?q=14th+October&w=98589557%40N00&ct=6&ss=2. 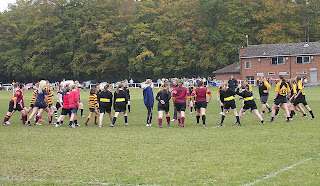 This year's Rochford 10s Charity rugby festival was blessed with fine weather in pleasant contrast to the rain & mud last year! With the early start came a misty morning which had only just cleared sufficiently to allow proceedings to get underway by the planned 10am. ... not sure I really understand this table! Obviously, Letchworth should be 4th - they were beaten by each of the teams above them - so no problem there - but did Basford win by virtue of a bonus point? All should become clear when the match scores are published. 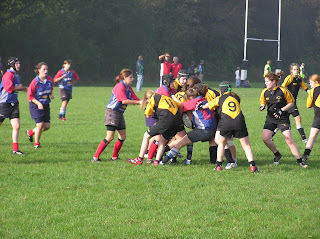 "On the 19th October 2007 our Under 16’s Youth Rugby team are going on Tour to South Africa!! They will be spending 10 days together, training, playing rugby, looking after themselves (without Mum and Dad) and learning about the culture of a completely different country. Importantly, the boys have also been collecting spare kit to take out to the South African Township teams, which is much needed. The Township Youth sides mostly do not play in boots as these cannot be afforded. Thanks to the generosity of British Airways, we now have the opportunity of taking an extra 32 kg luggage per person. 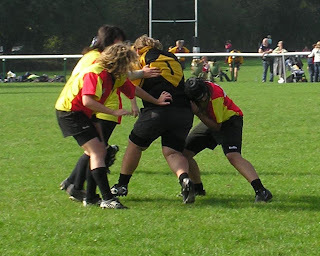 We are therefore hoping to be able to take as much kit for SA as possible and are asking local clubs for any outgrown boots, shirts, socks and shorts, plus any spare protective gear…scrum hats etc. PLEASE CAN YOU HELP? 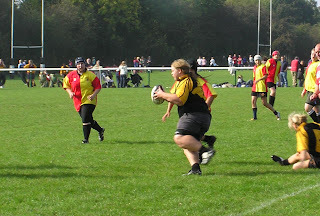 We particularly want to collect boots sizes 6 to 14…. (Any condition as we will clean, replace studs and laces). Please can you have a look in the lost property box and ask parents for any thing out grown. " If you are able to donate any kit for this project, please let Mike or Heather know as soon as possible so they can get it over to Luton before the lucky Luton lads set off. 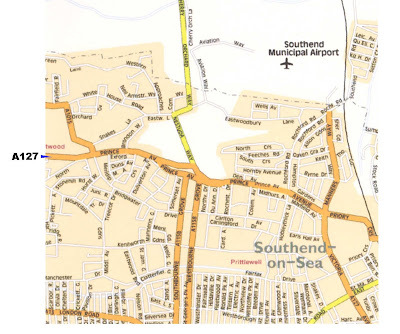 Another early start this Sunday - can everyone who is meeting up to get, or give, a lift to Rochford or just to travel down together, please meet at the club by 8.00 am. 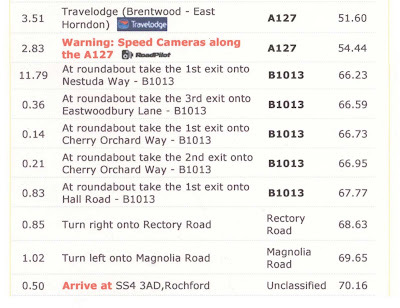 It's a 90 minute drive (if you don't get lost - see below) and we are aiming to arrive by 09.45 to have everything set up and ready by the 10.00 start. 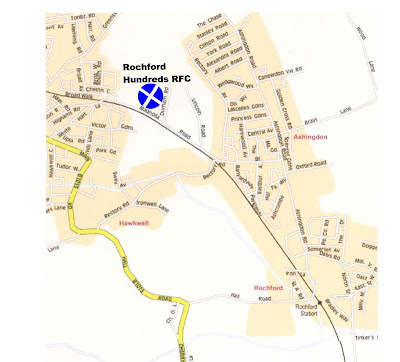 For those who have not been to Rochford before, I would like to say that there are more recommended routes to Rochford than there are members of the club ..... and they all seem to end up somewhere other than Rochford Hundreds RFC! One year, we tried an alternative route only to find John Birch going to the same club down the same road but in the opposite direction! (It will be no surprise to know that we were both on the wrong road!). This will become an un-made road continue down for about a half a mile, the club is on your right. " As John said on the blog last year ..." So, no problem then"! We want to start to collect availability details from everyone on a routine basis as we think that this might be a bit better than just standing in the club car park on a Sunday morning wondering who is going turn up. So this Sunday (or even earlier) could you try to bring with you any details you may have of any future holidays, dramatic performances, family events or other commitments which might prevent you from playing in any forthcoming fixtures, and pass these on to Mike Alcock so that we can see what numbers (and positions) to expect in future weekends. Obviosuly things will not be set in stone from now until May, but any information would be useful. Once we have the information in place all you need then do is let Mike know if anything changes. 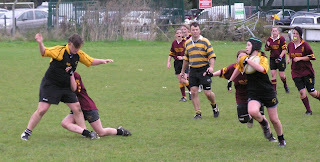 Several of you did the "Play Rugby" course last season, and a fair few also did the refereeing course. 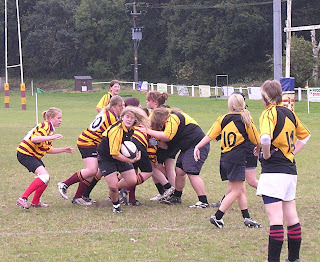 Would any of you like to take the next step and undertake the Level 1 coaching course? This is a two day course - and is really worth doing, not only so that you could help develop younger players, but it might even help you get the odd bit of paid employment (I speak from experience here!). 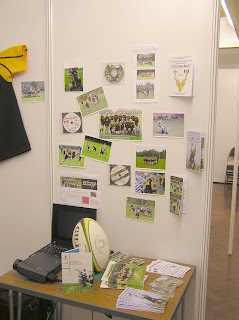 There is some funding available via Herts/RFUW (but it is limited! 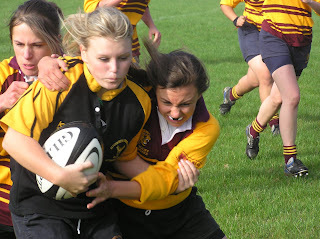 ), and also through the club, so you would not have to pay anything - the only requirement is that you need to be aged at least 16 on the first day of the course you go on. 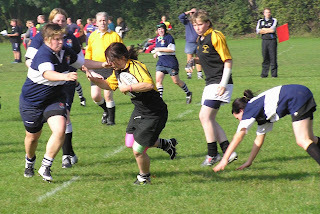 Do not worry about course dates at this stage - the important thing is that you let me know that you want to do the training so that we can put you forward for the Herts/RFUW grant (before it all goes). We can then worry about the where and whens of the actual course once we know who wants to go on it. In addition, anyone who got a Level 1 last season (Katie?) might also like to think about Level 2 for which there is oodles of cash around as thus far only one person in Herts has applied for Level 2 funding. However, this is a more time-consuming course so you should consider other time commitments you may have before putting your name forward. What's the difference between .....? 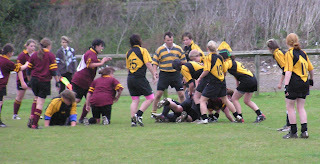 What's the difference between the All Blacks and a teabag? A teabag stays in the cup longer! Although neither of the usual picture takers were able to attend the match, we still have some fine photographs courtesy of Richard who kindly agreed to help out. Once again, many thanks to Richard for the photos. A thoroughly professional performance today by the U18s. Seven tries from six people, and a dominent performance by the forwards, winning practically every scrum regardless of put-in. 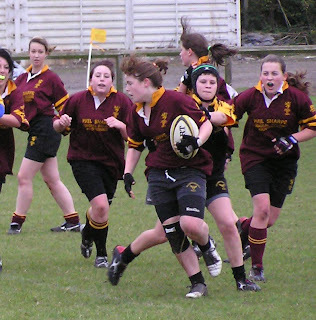 A few points to work on - the opposition at Rochford will not allow players to run through them quite as easily, and a similar lack of concentration at the start and finish could be very costly. 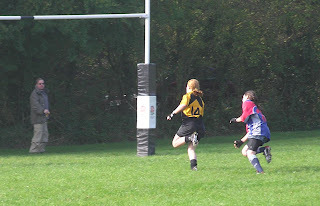 We also need to work on the kicking! 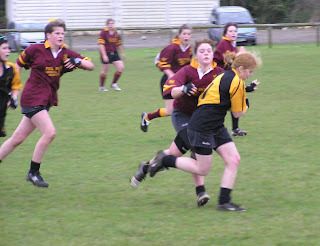 However it was great to see Ruby get her first try for two years - in fact since Rochford 2005 - and also see Carla keep going all the way to the line this time! But today was about more than the result. This was a good run out ahead of next week against a talented by largely inexperienced team - but a team on our doorstep that will grow and develop if they are given the experience. 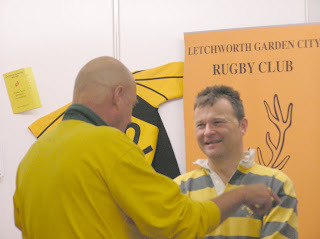 We will be seeing them again at Letchworth on 28th (thus filling the hole created by the postponement of the National 10s) and it will be interesting to see what they will have learnt from today. One other aim for the day was to try to see if we could combine our U15s (small in number, but experienced) with theirs (plenty of players but little experience). By and large this worked as well. 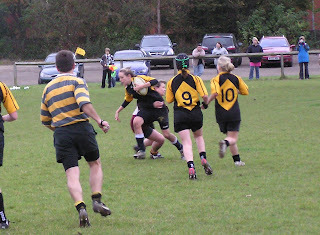 The joint training session may have been rather simple for those of our girls who are now used to a more robust approach to rugby, but the good news is that the Ampthill girls enjoyed workign with our people and that three of their most experienced girls should be joining us at Rochford next weekend thus ensuring that the U15s will have a viable squad (something we had been concerned about). At least one of Ampthill's U18s will also be joining us which will also give us greater options in our defence of the senior trophy as well. So all in all a very productive day - now the focus falls on next weekend. Can we be the first club to retain the trophy? For those of you who were unable to get to the first day of the GET INVOLVED! 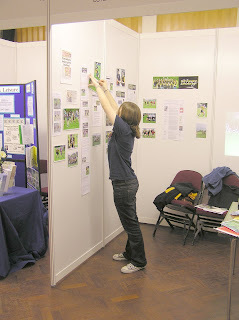 exhibition at Plinston Hall, here's a few pictures let you know what was going on. and stocked the table with the Girls section handouts, etc. Meanwhile, back on the girls stand, we were having a deal of success. 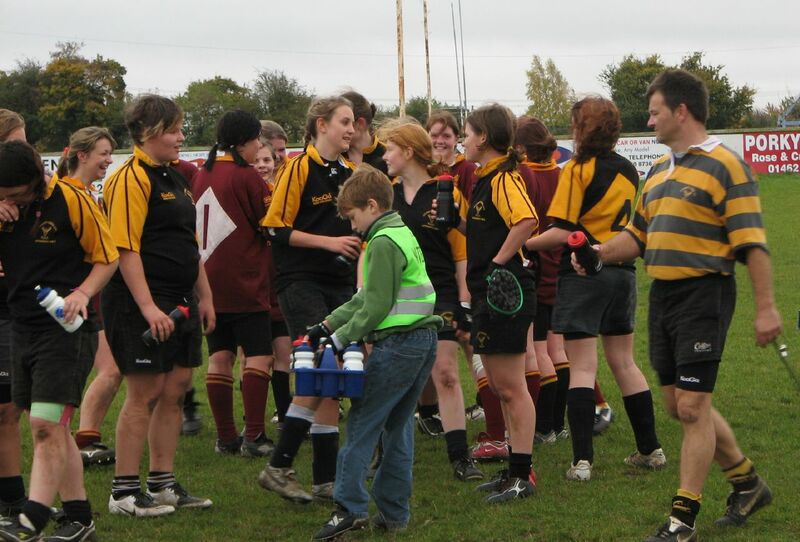 As you can see, Hayley is discussing the club with a new recruit who is already sporting the No. 8 shirt! 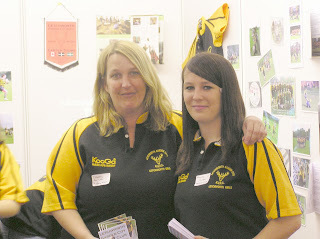 Hayley and Tracey set out around the exhibition to distribute our leaflets to as many likely looking girl players as possible while the rest of us settled to talk to any interested visitors. After an initial flurry of visitors it was rather slow going so we had a cup of tea, watched the DVD again and sent Mike back home to fetch a small TV so we could see the Australia v. England match! By 1.30 pm it was very quiet round the exhibitions and everyone retired to watch the game at home except Heather & Mike who stayed at Plinston Hall to greet any visitors to the two rugby club stands (and watch the game, of course!) 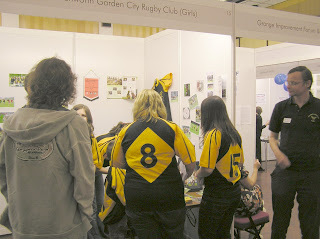 It was then that we experienced - between 2pm and 3.40pm - the most interest in our stands!! OK, it was mostly people asking what the score was, watching a bit of the game with us or asking if we had the West Ham game on (and I didn't even know that West Ham played rugby!) but it was rather fun. 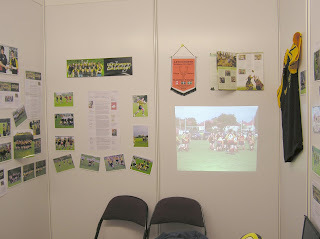 Every time the Royal Naval Association stand next to us played their DVD, our TV got covered in interference and it was quite funny when 4 people tried to watch Jonny kicking for goal on our 5" TV screen!!! In the final hour of the exhibition, we received a few more visitors and then, having played the DVD 40 times, we packed things away for the night. 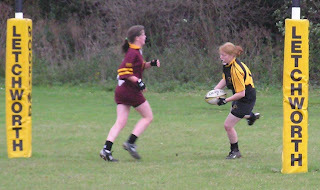 U18s & U15s matches at Ampthill this Sunday!